Your one-stop source for delicious nostalgia and retro candies. Candy products bursting with irresistible flavor. Tasty nougat taffy in an assortment of flavors. Roasted cashews, almonds, dried fruits, seeds and grains, lightly sweetened with cane sugar. Using natural ingredients. 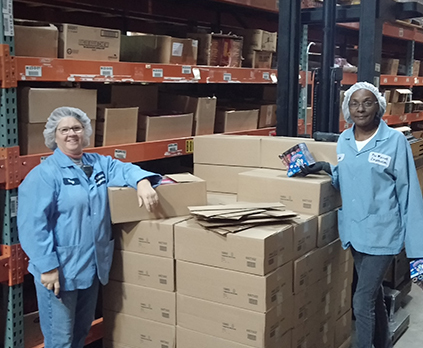 This image features the Pennsylvania Dutch Candies distribution center and two of our workers; Vicky Forry and Janet Jackson. With more than 50 years of Sweet Success, Warrell is proud to be one of the top contract candy-manufacturing companies in North America. Our development and mastery of eight core manufacturing processes, including chocolate enrobing, chocolate panning, fire roasting, brittle, nut clusters, caramel, taffy and tumble drum to make protein-rich snack bites enables us to serve the needs of many of the top food companies worldwide. We also produce our own popular confectionary brands including Pennsylvania Dutch Candies™, Katharine Beecher®, Flipsticks® and Classic Caramel®. Similar to most great American business success stories, our company now known as the Warrell Corporation rose from humble beginnings. We started in 1965 in the small town of Mount Holly Springs, PA as Pennsylvania Dutch Candies — a specialty candy manufacturer, specialty food distributor, and marketer, serving gift stores and restaurants across the U.S. We sold the markets that were not being serviced by the big three. Pennsylvania Dutch Candies continues to operate as a unit of Warrell and remains our most popular brand. We continue to focus on servicing the tourist trade and traveling customers through specialty retailers. Over the following decades, we continued to diversify into candy and snack manufacturing. Milestone events in our history were the acquisition of Katharine Beecher Candies in 1974, followed by Melster Candies nearly a decade later. In addition to candy and snack manufacturing, we expanded our capabilities to include ingredient, mainstream retail, contract, and private label customers. The phenomenal growth of our company created the need for a larger facility to better serve our rapidly expanding contract candy and snack manufacturing customer base. This led to the renovation of a sprawling, state-of-the-art 200,000-square-foot facility in Camp Hill, PA. We further increased our production capabilities by purchasing Classic Caramel and its 30,000-square-foot facility in York, PA in 2009. Our unrivaled combination of solid facilities, top-quality products, innovative product ideas, and contract candy and snack manufacturing expertise developed over the past 50 years will help us serve our customers for the next half century and beyond. In November of 1918, Warrell unveiled Warrell Creations as it’s private label and contract manufacturing division. Contact us for your next candy or snack project! For the past four years, The Warrell Corporation and CAL Marketing have been partners in creating some of the most innovative and on trend products in the candy industry. With 50 years experience in candy manufacturing, Warrell’s knowledge has helped us bring new ideas to life, enabling us to expand our range to more than 20 plus items in the past few years. With a large dedicated staff, Warrell has had the ability to make us feel like their only customer, with their friendly customer service and experienced R&D teams working closely with us from product development to dispatch. Working with Warrell has been a delight and we look forward to many more years of exciting candy creations! “Sweet Factory has always carried the classic candy from Warrell – all of the flavors of the Bonomo Turkish Taffy. I have been purchasing from Warrell for over 15 years and find their quality second to none. The customer service is always warm and friendly. I would highly recommend.